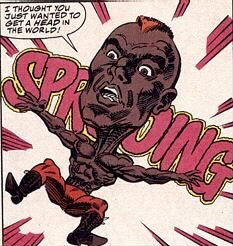 Powers: Every portion of Enigmo's body, when separated, remains under his control, and can re-shape itself into a duplicate of his body. If his body is divided into 12 pieces, 12 smaller versions of himself will exist. He can re-merge his body together again at any time. It is likely that he possesses other abilities related to shape-shifting, but so far, they are unrevealed. History: (Avengers I#370) - A member of Warlord Kro's Delta Network, Enigmo was contacted by him following one of his matches at the Unlimited Class Wrestling Federation. 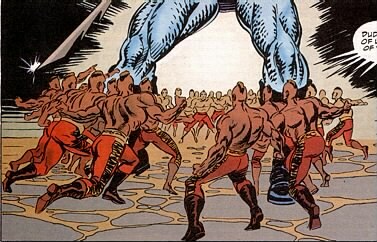 Several of the Avengers had been captured by Ghaur, who was planning to use them in the creation of a Uni-Mind. Kro enlisted Enigmo to help save them, and assigned him, the Red Bull, Karkas and Ransak to save Giant-Man and the Black Knight from Lemuria's arena. (Avengers I#371) - Enigmo fought the Black Knight; in the course of their battle, he was sliced into a number of pieces, but continued to battle nonetheless. They then combined their forces to battle Ghaur, and saved the Avengers, but had to leave with Ghaur still in command of Lemuria.